a report by By Josh Biven of The Economic Policy Institute. Notes: Data are available beginning in different years for different countries. First year of data availability ranges from 1970 (for Austria, Belgium, Canada, Finland, France, Germany, Iceland, Ireland, Japan, Korea, New Zealand, Norway, Spain, Sweden, Switzerland, the United Kingdom, and the United States) to 1971 (Australia, Denmark), 1972 (Netherlands), 1975 (Israel), and 1988 (Italy). Examining data on utilization and prices separately shows clearly that it is high prices that drive the U.S. position as an outlier in health care spending. Figure K shows the utilization of physicians and hospitals in the United States compared with the median, maximum, and minimum utilization of physicians and hospitals among its OECD (Organisation for Economic Co-operation and Development) peers. 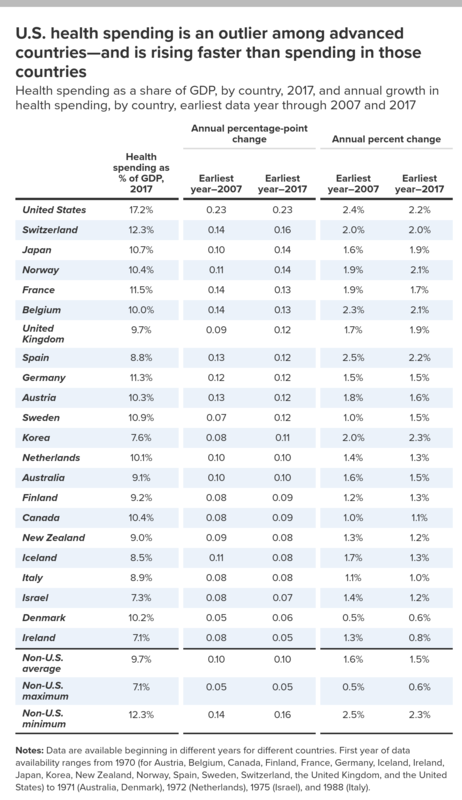 The United States is well below typical utilization of physicians and hospitals among OECD countries.